International negotiations on a legally binding instrument—the Minamata Convention on Mercury—were completed in Geneva in January 2013 and presented for adoption and signature at the Conference of Plenipotentiaries, held on the 10th and 11th of October, 2013 in Kumamoto, Japan. 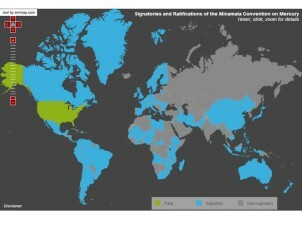 93 countries have signed the convention, including the United States which just signed last week. It will enter into force once 50 countries officially ratify it. “We’re hoping that it will take a maximum of three years for ratification and that we will have early ratification based on the overwhelming support we have seen here, with 93 signatories and 139 countries in attendance,” commented Tim Kasten, deputy director of UNEP’s Division of Environmental Policy Implementation. By 2020, the treaty will ban a range of mercury products and will forbid mining of fresh mercury, and after 15 years of coming into effect, mercury emissions from new power plants will be banned. Countries will also be required to devise plans to curb artisanal and small-scale gold mining operations, which is one of the biggest contributors to mercury pollution. These guidelines and restrictions mark “the beginning of the end of mercury as a threat to human health and the environment,” remarked UN Environment Programme (UNEP) executive director Achim Steiner. The treaty requires critical obligations that affect primary mining of mercury, mercury product phase-outs, mercury use, trade, emissions and disposal, among others, that taken together will eventually lead to global mercury reductions. Tim Kasten describes the work ahead as including “a thorough scientific review of the mercury problems,” specifically identifying problematic hotspots, sources, products with mercury, and mercury emissions. On a scientific level, the Convention needs to engage global observing, monitoring, and modeling systems that can provide data on mercury concentrations in all environmental areas, including the oceans. “It will be a fairly significant undertaking to help identify what the best available technology and best available environmental practice requirements will be,” Kasten says. With only 45 mercury-monitoring stations around the world, and lack of measurement in the Southern hemisphere, this technology is critical infrastructure for the success of the Convention. Partnerships within the international scientific community will drive the development and implementation of mercury-monitoring technologies. Additionally, financial backing is paramount. Developed countries must contribute to funding that aids technical assistance, especially in poorer countries. Japan, Switzerland, Sweden, and the Global Environment Facility have already collectively pledged approximately US$30 million, which will enable implementation of the Convention before it comes into force. This is a great start, but Kasten says this is well short of the US$100 million needed to assist countries with implementation. Though there are scientific and financial barriers to overcome, Elena Lymberidi-Settimo of the Zero Mercury Working Group, an international coalition of over 95 public interest environmental and health non-governmental organizations from more than 50 countries from around the world, is encouraged by the positive initial participation and urges that “50 countries step up and ratify by 2015 —‘50 by 2015 – Make it Happen! Governments and all the stakeholders involved need to build upon this momentum by continuing to undertake mercury reduction activities in parallel, and ratifying the treaty as fast as possible.” Without quick ratification, mercury pollution will continue to be a problem, and human and environmental costs of unabated mercury pollution will only increase. Lymberidi-Settimo importantly notes that, “NGOs are needed to ensure that the process is balanced, transparent, and our technical experts can contribute their knowledge and experience.” To ratify and implement an international convention, all sectors are involved, which requires not only great cooperation but also great clarity in expectations. Mercury is considered by the World Health Organization as one of the top ten chemicals or groups of chemicals of major public health concern. Even exposure to small amounts of mercury may cause serious health problems and is a threat to the development of a child in utero and early in life. A significant example of mercury exposure affecting public health occurred in Minamata, Japan, between 1932 and 1968, where a factory discharged liquid waste including high concentrations of methylmercury into Minamata Bay. Fishing was the main source of livelihood in Minamata, and the methylmercury toxified the bay that was rich in fish and shellfish. For many years, no one realized that the fish were contaminated with mercury, and people in Minamata and surrounding communities were unknowingly being poisoned by mercury. At least 50,000 people were affected, and more than 2,000 cases of Minamata disease were certified. Minamata disease peaked in the 1950s, with severe cases suffering brain damage, paralysis, incoherent speech and delirium. A symbolic ceremonial opening was held in Minamata, Japan, on the 9th of October prior to the Conference of Plenipotentiaries to honor the detrimental mercury exposure that affected this community. Sources of mercury pollution range from burning coal for power, gold extraction and other industrial processes, to being used in products like batteries, measuring devices such as thermometers and barometers, electric switches and relays in equipment, lamps, some types of light bulbs, dental amalgam (for dental fillings), skin-lightening products and other cosmetics, and pharmaceuticals. Therefore, to eliminate mercury pollution with the Minamata Convention on Mercury, solutions and targeted areas will be to promote the use of clean energy sources that do not burn coal, eliminate mercury mining and use of mercury in gold extraction and other industrial processes, phase out use of non-essential mercury-containing products, and implement safe handling, use and disposal of remaining mercury-containing products.